Babytime developed by Simfler is an app that enables parents to track their baby’s activities easily with a smartphone. With each information put in, parents receive a personalized feedback catered to the needs of each baby, consequently encouraging parents to feel confident and helping them to raise a healthy baby. Can you tell our readers what BabyTime is? 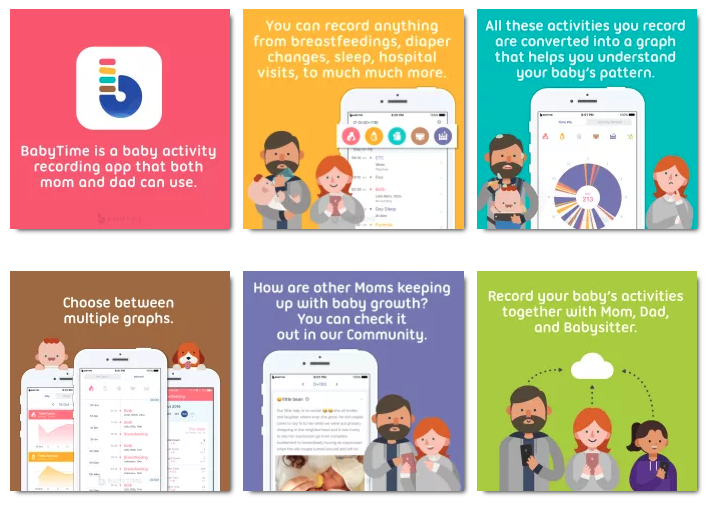 BabyTime is an app that helps you record your baby’s daily activities with ease. Nursing, formula, baby food, diaper, and sleep are a few examples of the array of activities you can choose from. All the activities you record are calculated and converted into simple, comprehensive graphs and charts. BabyTime helps parents keep track of their baby’s natural cues and helps establish a stable routine that is healthy for both mom and the baby. Another unique feature of BabyTime is that you can record your baby’s height, weight, and head circumference and share this information with other parents within the BabyTime community. You can see the growth of other babies as well and it provides great insight into how your baby is growing along with other babies that of the same age. When my first child was born, my wife had to write down every detail of our baby’s day so that she could get a better sense of why he was crying. What time and how many times did she breastfeed the baby? Changed diapers? What time did the baby take naps? We kept a baby book and it was helpful but at the end of the day, it was a lot of information to remember and writing it all down took a long time to do. So, I decided to make an app to make all this easier for my wife. I created an app where you could record all your baby’s activities at the touch of a button and will also calculate and create graphs automatically. Raising my own baby, wanting to help my wife, and having the desire to share with other new parents my experience of being a parent inspired me to create BabyTime. Smartphones had just been released at the time my first child was born, and being a developer with great interest in technology, I knew that I should make an app. How can BabyTime help parents and caretakers? Parents and caretakers can record the daily activities of a baby together. Information is shared across devices so whatever the parent of the caretaker records is synced in real-time. A nanny will know exactly how much and what time the baby needs to be fed, nap, and all other details of the day. Furthermore, parents who work won’t ever have to miss their baby’s milestone because the nanny can share it with the parents the moment it happens. BabyTime lets anyone (who are invited, of course) be involved in raising your baby. Can you briefly explain what are the features available in BabyTime? Invite caregiver and add multiple babies. Automatic backup so you can use BabyTime on any devices. Customizable graphs and growth chart. Tell us why do you think BabyTime is a “must-have” app for every parents and caretaker? Once the baby is born, we find out that all the preparations we’ve done before are just fluff. Nothing can prepare us enough. BabyTime will be like that friend who’s already been there and help parents feel assured that their baby is getting fed the right amount, sleeping enough, gaining the right amount of weight, and everything else. It’ll eventually help you to establish a consistent routine as well so that you and the baby could settle into a routine that works. Which part of BabyTime that you like the most and why? I love the widgets feature because I can see at a glance of how much time has passed since my baby has been in bed or slept. You can choose to see other activities as well without even opening the app itself! Can you tell us why BabyTime is different from other baby apps? We have users who simply track sleep and feeding to users who every little detail so we make sure that all our users are able to put in activities easily. Also, you can rearrange activity icons depending on how frequently you use them. Another aspect that sets our app above other is our Community. Users can share and see posts about babies that are exactly the age as their baby. We at the planning stage to implement how babies grow by growth stage and how the condition of a child’s environment can affect their development. Who are the team members that design and develop BabyTime? At first, it was just my co-founder and I but now we are a team of 9 people. Our developers are moms and dads, so they bring invaluable insight to the table. We have a great design, planning, and marketing team who work hard to grow our company. Apple App Store. Click here to download. BabyTime is currently available for iOS user only. Do you plan to release an Android version soon? Yes, our app has been released on Android for 5 years in Korea and we are currently the #1 parenting app here. We are planning to release the Android version globally in the beginning of next year. What other feature you are planning for BabyTime in the future? We’re planning to add widgets, alarms, stopwatch, and more ways for users to interact (such as the “like” button) in our Community. Do you have any parenting tips or story to share with the readers? My second child was born a month early, so he was underweight and seemed to be developing slower. We realized that premature babies do not have the same development timeline and we’d have to adjust his development accordingly. So then, I needed the growth chart in my app to calculate my son’s growth from his due date, as opposed to his birth date. After implementing this feature, I received a lot of thank-you messages from parents who have premature babies. Before having children of my own, I could have never imagined how hard it would be to raise a child. But we soon realized the happiness we get from our children is priceless.